Antique Radio Forums • View topic - Id Sylvania radio, please? Post subject: Id Sylvania radio, please? Can anyone tell me the model of this cool looking Sylvania? Is it vt or ss? *Edit* Sorry - forgot the pic! Post subject: Re: Id Sylvania radio, please? WOW! That was fast!! Thank you, Greg! I have that same radio, but, it's an Arvin. Been collecting for 45 of my 61 years and have never seen that one ! Cool looking. Motoroddy says has one branded Arvin, if so, its right at the end of Arvin's production. Arvin probably made it for Sylvania. The guy has this one and a Raytheon portable direction finder I think is different - he wants $40 each. I'm tapped from Christmas, but I'm hoping he'll have them next week - if so, I'm thinking of offering $50 for the pair...Neither works, but both look nice physically ( I think the missing knob on the Raytheon shouldn't be too hard to find - or is that the only correct one? ) - Thoughts? The spot on the tag which says "Manufacturing license W.G. 24"
That was typically found on radio made by Wells Gardner in Chicago. 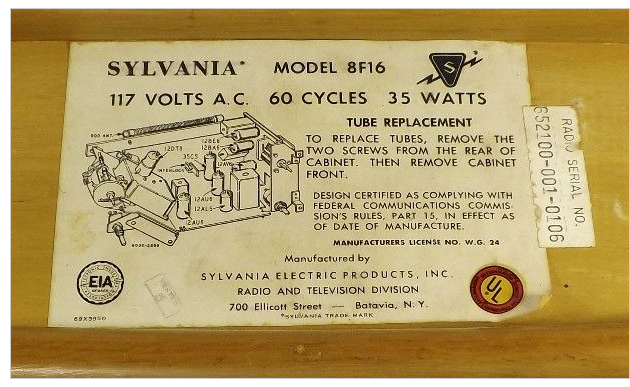 At some point Sylvania bought out the Colonial plant in Buffalo to manufacture radios and televisions. They had always been a tube manufacturer and never made their own products until this purchase. However, it didn't mean they couldn't farm out production elsewhere. Is there any connection between Wells Gardner and Arvin?